Jackie Brown (Pam Grier), an airline stewardess and part-time money smuggler for Ordell Robbie (Samuel L. Jackson) , is arrested and charged with possession and intent of cocaine. When bail bondsman Max Cherry (Robert Forster) gets her out, she is left with a choice; accept the charges and return to jail for her full sentence, or remain free but help the cops catch Ordell. However, neither seem to be an appropriate situation, as prison is prison, but if you cross Ordell, you're dead. So, Jackie comes up with a plan, that results in neither situation; working for both sides at the same time. This is essentially the definition of a Tarantino film. From beginning to end, it's packed with typical Tarantino iconography and every stylistic convention of his you can name. But, these are more recognisable now. 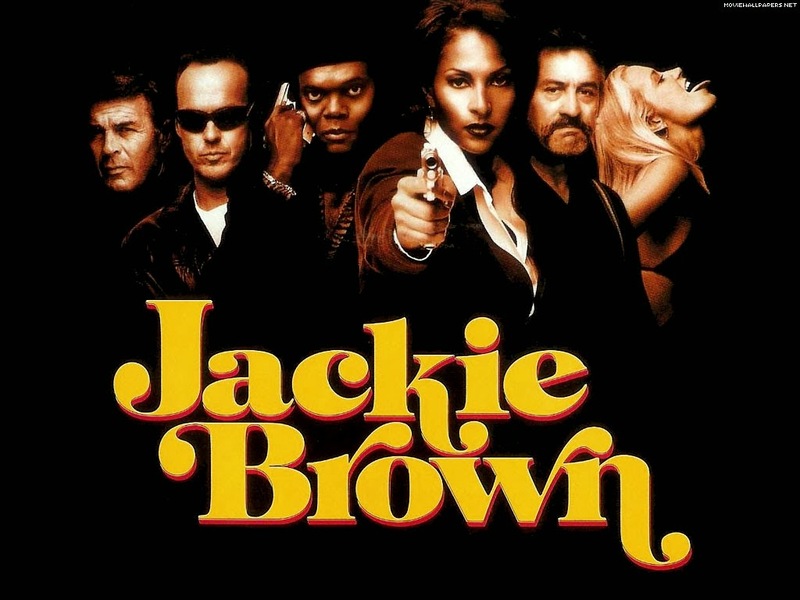 Back in 1997 as only his third feature film, Jackie Brown would have been seen as widely innovative and unique; only his later, and arguably better, films have allowed this innovation to be seen as convention for his style. But does this subtract from Jackie Brown? Not in the slightest. Widely seen as one of his weaker films, I wasn't expecting much. Maybe this is the reason I enjoyed it so much, but either way, Jackie Brown is one hell of a ride. Stealing this film for her own, and rightly so, is Pam Grier. Confident, cocky and charismatic, she plays the title role with ease, making her simultaneously likeable, but also untrustworthy; a strange combination for a lead character. Supporting her are the always excellent Samuel L. Jackson as sort-of-villain-sort-of-cool-guy Ordell, Robert DeNiro as the brilliantly likeable Louis Gara, but primarily Robert Forster as top notch sidekick and bail bondsman Max Cherry. With a cast like this, it would be difficult for the acting to fail anyway, but boosted by Tarantino's genius scriptwriting and smart storyline, all involved are able to use their acting skills fully, allowing us to get fully into their characters. This proves to be a vital part of the film, as Jackie Brown is very much a character driven film. Whilst previous Tarantino efforts such as Pulp Fiction and Reservoir Dogs remain driven more by innovative editing and violence, Jackie Brown fully relies on its characters to bring the film to the final act. It struggles here and there, some scenes feel far too long and there isn't really enough content to fit a 2 and a half hour run time, but for the most part Tarantino manages to pull this off. The story itself is relatively simple, and it's fairly easy to follow, and this allows the characters to be the sole force driving us through each act. This is not an easy feat to pull off, but Tarantino, as usual, copes. As previously mentioned, Jackie Brown is pretty much the definition of Tarantino's style. His ingenuity shines through from beginning to end, and the film is laced with his brilliant touches. Tiny, tiny details such as intertitle cards that go from "Money Exchange- Trial Run" to "Money Exchange- For real, this time" are brilliant ideas that no other filmmaker could come up with, let alone be experimental enough to include them in the film. His usage of contrapuntal soundtrack and long takes also remain unmatched today, and are highly likely never to be matched in a very long time. There is something about Tarantino's style that I can't quite put my finger on yet, perhaps I will with further research, but everything he touches turns to cinematic gold. All in all, no, Jackie Brown is not his finest film. It's far too long for a film with so few actual events, and it doesn't ring with memorable moments like Pulp Fiction or Inglourious Basterds, but for the most part it is still undeniably entertaining. Filled with great acting, a strong script and a solid story, it makes for a great time. As with most of his films, it takes its stride in the final act, where the stakes are raised and the action really takes off. It's far from Tarantino's best work, and it is likely to be forgotten about in ten or twenty years when he has more then ten films to his name, but for a now sixteen year old film, it's just as fun as you might hope. 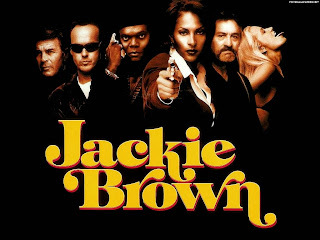 To Summarise: Despite an overlong running time, Tarantino's "Jackie Brown" is nevertheless a well scripted, powerfully acted and brilliantly unique crime drama.